Charlie is an assistant in a pawnshop, run by an older man in wearing a skullcap (kippah, yarmulke, or taqiyah). He is sent to do some dusting and winds up making a bigger mess and getting into a fight with his co-worker (John Rand). He goes outside with a large ladder to clean the sign over the shop, and winds up hurting Rand several more times, and running afoul of a local cop. Once he and Rand have avoided the cop, they begin fighting again, to the dismay of Edna Purviance, the shopkeeper’s daughter. Charlie pretends to be hurt and gets her sympathy, but the shopkeeper wants him fired. He has a change of heart and lets him stay. Several customers come in, in succession. First, an old man (Wesley Ruggles) tells a tale of woe and hardship and how he must pawn his dead wife’s wedding ring. Charlie feels sorry for him and offers five dollars, but only has a ten. The man pulls out a huge wad of bills to make change. Another customer is a thief (Eric Campbell), who persuades the shopkeeper to show him all of the fancy jewelry he keeps in the safe. Then, a man (Albert Austin) shows Charlie an alarm clock he wants to pawn. 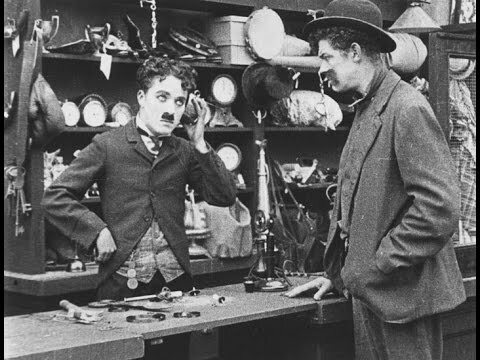 Charlie can’t get it to work, so he dismantles it piece by piece in front of the man, then sweeps the mess into his hat and gives it back to the man. 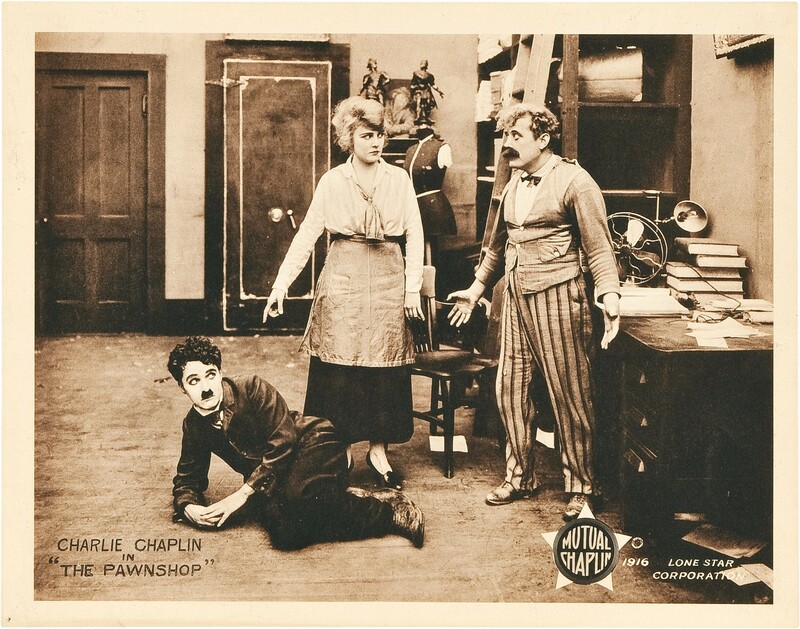 After he leaves, the thief tries to hold up the store with a gun, but Charlie is hiding behind him and knocks him on the head, saving the day. 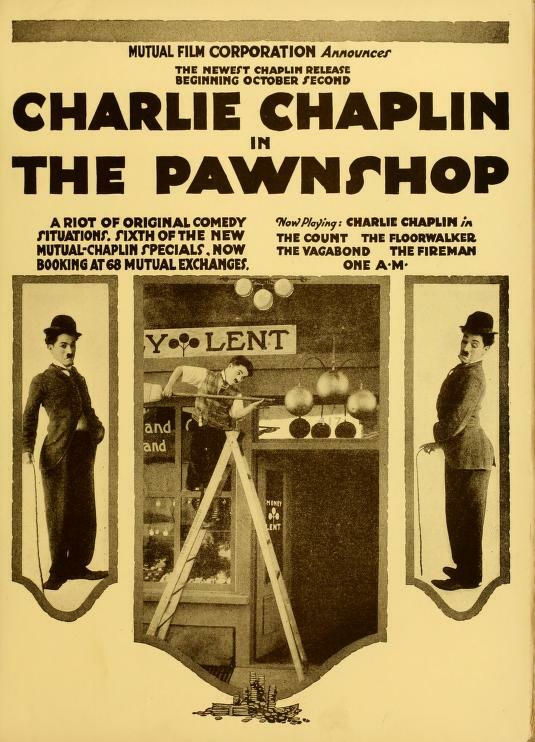 Although there is some good stuff in this movie, a lot of it feels recycled, such as the bit about Charlie using his slapstick skills to stop a robbery and the cleaning sequence which is very similar to “The Bank.” One brief gag I didn’t mention was a quick re-do of the opening to “The Bank,” where Charlie opens a safe and takes out his workclothes. This, time, about halfway through, he goes to a safe, quickly turns the combination seemingly at random, and takes out his lunch. It isn’t as funny or surprising this time. 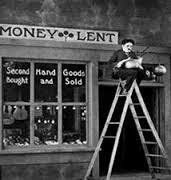 My favorite parts were the whole ladder sequence and the scenes where Charlie is “helping” (or being bilked by) the customers. His character is less “innocent” and likeable than in “The Vagabond,” for example, but one still sees him as sympathetic – he’s a victim of circumstances and it’s hard to blame him if he wants to get back at some of the people who mistreat him. The romance between him and Edna is decidedly downplayed in this movie.